I’m one among the few individuals who manage to lose weight and keep it off. Want to know how I do it? Here are some of my health and fitness rules. These are my personal rules that you don’t have to follow. However if you do, you’re sure to benefit in one way or another. Let me start with my eating rules. When I eat less, I feel better. Foods taste better, I feel happier and less worried. You may already know that eating less can help reduce risks of cancers and diseases. I drink orange juice from a real fresh orange. No bottled or canned orange juice. I’m sure you see what I mean. I don’t take supplements. That’s right. Reading through my blog, you won’t see me recommending any supplements. Fancl House, GNC...no way to make money from me. If you eat a variety of real fresh good foods, your need for supplements is close to none. And I’m not alone. In fact, overdosing on supplements/ antioxidants may take your health in the wrong direction. I successfully lose weight and stay fit by eating less. More importantly, that’s the way I enjoy. I suggest your finding a sustainable and “enjoyable” way of eating less. That way you will stick with it because you enjoy it. If you want to learn how to eat less in an enjoyable way, here are the two books I recommend: 2 Meal Solution and Eat Stop Eat. The more you cook for yourself, the healthier you eat. Do learn to cook and teach your kids to cook as well. No time? Do you have time to date your boy friend or girl friend? Why not cook together? Share the fun of cooking with people you love and eat healthier. Eating salad is healthy, isn’t it? But don’t forget the dressing which makes you fat. I start making my own dressing after reading this article - The Salad Dressing To NEVER Eat. It’s quick and easy, however delicious and healthy, and I’m never tired of it. if you seriously want to know “what to eat”. You don’t have to agree with it all…but at least it gives great insight into food and your health. These are my health and fitness rules in terms of eating. I’ll continue with my workout rules. I wish you eat well! To repeat, I’m one of the few individuals who manage to lose weight and stay fit. I’ve mentioned my eating rules in my previous post, here are some of my workout rules. Again, you don’t have to follow, but if you do, you’re likely to benefit in one way or another. In fact, my eating rules and workout rules in some perspectives are quite consistent. Let’s see. An apple everyday keeps doctors away. My ‘apple’ is the exercises that I do in the first 20 minutes of every morning. It does not keep me away from doctors permanently, but once I started, I didn’t see my doctor for two years. I have been doing this for many years. If you want to minimize your medical bill, try it. I eat fresh and natural. Likewise, I workout naturally. I have a gym membership, but I go there mainly to use the pool. I won’t do treadmills or row a stationary boat. That’s too boring. Instead I do jogging in a park or rowing a real boat. You see what I mean. Enjoy a natural breeze and breathe well in the nature while working out. 3. Concentration Seriously, have you ever read or watch TV while doing any exercise at your luxury gym? If so, you're not concentrating enough on what you're doing, plus you're probably not working out hard enough to see any real results. You won’t talk on a mobile phone while swimming, will you? Do exercise that requires your full attention and you’ll see real results. Here is a very insightful article on this topic: Do You Really Need Cardio? 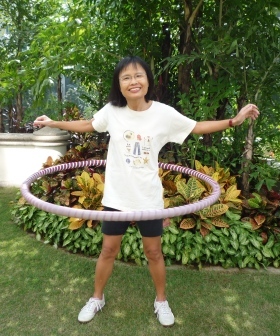 Do you enjoy jogging or playing hula hoop? Personally, I enjoy playing hula hoop more than jogging, though both exercise spent the same amount of calories. I also enjoy swimming, so I do both exercises alternatively. I’m never tired of the exercises that I do. Because I only do whatever I enjoy to do. See how much fun I am having. You will only stick to doing something that you enjoy and continue doing it. If you don’t, you’ll soon quit. How often do you do exercise? Once a week for a couple of hours or 3 x 30 minutes per week? Both are fine, provided you don’t do it for a month and quit. If you do it for a month or so, it’s just better than not doing. Want to see the real results that your workout contribute to your health and weight loss, you must do it over the long run. I have been doing morning exercise over the past 20 years and I’m sure I won’t give up. Likewise for my weekly 3 x 30 which I started 10 years ago. These two Health and Fitness Rules articles were originally posted at my fasting blog http://go-fasting.blogspot.com in November 2010. Final thought: If you follow any of the health and fitness rules here, I'm sure you'll see the benefits. The more you follow the better.